I am a sucker for a good burger. When I see it on the menu I usually have to order it. I have friends that are always asking where to find THE burger. Restaurants are so creative with their burgers and they are using such quality meat and local produce that it’s often reflected in a higher price. Once you try it, you will find it’s worth it. 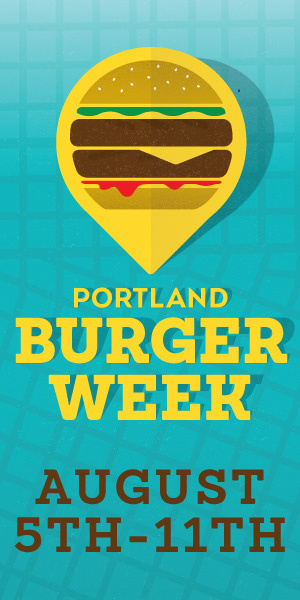 That’s why I love that Portland Mercury is hosting a Burger Week.It gives you the opportunity to try several at a very low price. So, don’t be shy, try away. Still not sure? Then take a buddy and split one. Here is how this will work. Several restaurants will offer a burger, for the week only, for just $5. Now, I have looked through their site, and these aren’t just wussy burgers. No these are for the serious burger lovers. Here are the restaurants that are participating in Burger Week. Alberta Street Pub – Elk Burger with pickled cherries and chanterelle mayonnaise. Foster Burger – bacon, kimchee, pepper jack cheese, American cheese, spicy cilantro aioli,Xuyen bun. Which one is on your list? You had better get busy with that list Lisa. 🙂 Good thing some are such a good deal this week!